Until 150 years ago, most of the world was illiterate, and sacred texts were taught and experienced in an oral tradition. Now, when much of the world's population can read, and books are relatively inexpensive, people are reading the literature silently by themselves. But has something important been lost in the change? 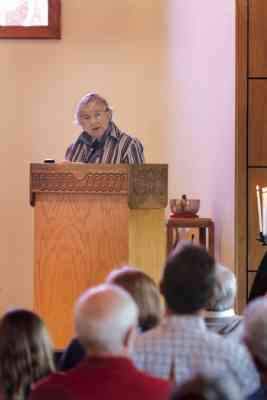 Speakers in a summer lecture series called "Bringing Texts to Life" are exploring that question at the Unitarian Universalist Fellowship of Durango, the second year in a row the fellowship has considered a single topic in myriad ways. "Sound is temporal, and text is static," said Katherine Burgess, the series organizer. "Sound is shared, text is individual." Burgess has a doctorate in humanities and is a professor at both Fort Lewis College and Southwest Colorado Community College. She kicked off the series with a lecture introducing the overarching theme on June 7, pulling ideas from a wide variety of sources, such as the sacred texts of various religions and The New York Times. A recent editorial in the publication by Verlyn Klinkenborg mused on the "lost art of reading aloud." In earlier times, it was common for literate families and friends to read to each other, and people made their own music at home instead of listening to recordings by professional musicians. "One of the most basic tests of comprehension is to ask someone to read aloud from a book," he wrote. "It reveals far more than whether the reader understands the words. It reveals how far into the words - and the pattern of the words - the reader really sees." Burgess remembers when she was young, sitting around the kitchen table and reading a chapter of the Bible every night. Even though many of the words from the King James version had to be intuited from context, the beauty of the language enriched the experience. "Children don't pick up patterns or understand concepts when reading to themselves," Burgess said. "I still remember thinking it was 'sleep in heavenly peas.' It's a creative act to interpret." In the earliest sacred texts, the stories were told verbally by the priests, then became "scriptualized" where the story stuck to the established order, Burgess said. Alphabets were created to reproduce sounds, not to make words objects in themselves. "Once they became holy texts that couldn't be revised, priests were devalued to keepers of the text rather than storytellers of the sacred tradition," she said. "After all, God created the world with sound," she said, then quoted from the Bible. "And God said, let there be light, and there was light." Sunday – Poetry as Spiritual Practice: A Way of Knowing, a Way of Making Known, by Doreen Hunter. June 28 – Nonviolent Communication: A language of life, a path to peace, by Terry Swan. July 5 – Walker Percy’s The Moviegoer, by Brooks Taylor. July 19 – Lover Boy: The Legend of Don Juan, by Judith Reynolds. July 26 – The "Ramayana," by Sara Ransom. Aug. 2 – Antigone by Sophocles, presented by Judy Hook. Aug. 16 – The Power of Tolle: Thinkin’ about the future, worryin’ about the past, by Dinah Leavitt Swan.